divided into services aimed at these two applications. A Business Mail Large Letters service is being introduced for senders of transactional mail, magazines and other non-fulfilment uses and these rates are approximately 5% above the 2013/14 rates. The pre-existing standard Large Letter services will be used for mail that does not meet the requirements of Business Mail (i.e. predominantly goods fulfilment items, or items in jiffy bags or cardboard packaging). 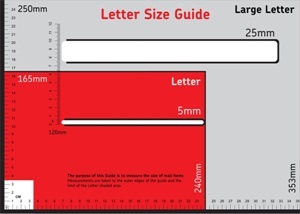 The charges for the standard or general Large Letter services will increase by 21.4%. The majority of Large Letter volumes processed by UK Mail do meet the requirements for Business Mail. We will therefore be remapping our services so that our main Large Letter options are presented to Royal Mail as Business Mail. As a result, most of our customers will not need to make changes to how they process their mail to obtain the lower Business Mail prices and will be able to continue to choose the Large Letter services. Business Mail Large Letter Content Guidelines.